Why Not Cricket At The 2012 Olympic Games, London? Why Does the World’s #2 Sport Need the Olympics? The dream of winning an Olympic Medal inspires athletes from all over the world, and it will motivate athletes in countries that do not currently play Test cricket or the World Cup. The Olympics is the largest stage in the world for sports, and being in the Olympics will help cricket spread faster throughout the world. 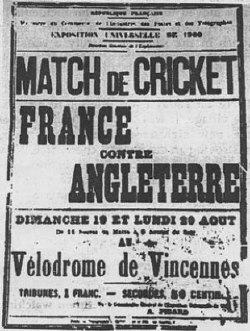 Cricket Europe article: Cricket in the Olympics? Barbados Lawyer Hal Gollop: Is He Unethical? Underhanded? Back-stabbing? … or Perfectly Proper? … from The Nation News article Pay Up! Attorney Hal Gollop Represented Andrew Thomas THEN Stanton Alleyne! Will somebody please tell me how it is ethical for a lawyer to represent Andrew Thomas in a civil dispute involving the SSA and Stanton Alleyne… and then to later switch sides and represent Stanton Alleyne in the same ongoing dispute? I thought that things like this just weren’t allowed. I thought that after representing one party in a lawsuit or potential lawsuit, that no honest or ethical lawyer could then turn around and represent a party on the other side of the same dispute? Let’s hear from our Barbados legal community. We’d like to know if the actions of Hal Gollop are considered ethical by other Barbados lawyers and judges. This December 28th will be the sixth anniversary of the assassination of retired Barbados Immigration Chief and former Assistant Superintendent of Police Kenrick Hutson. The case is as ‘cold’ as they come with not a squeak from the police or newspapers since Hutson was shot down in front of his family. We at BFP try not to forget even if our leaders do. Retired Barbados Immigration Chief and former Assistant Superintendent of Police Kenrick Hutson was gunned down in front of his home on Friday December 28, 2007 while his wife and daughter were inside. That is six months without an arrest and without a further mention of Mr. Hutson in the Barbados news media. It is as if he never existed at all. One would have thought that the Royal Barbados Police Force would have moved Heaven and Earth and never rested until those who murdered a colleague were captured or dead. Perhaps there is some large scale task force working diligently but quietly to hunt down Mr. Hutson’s murderers? Perhaps there has been further interest in the Barbados media with many stories – and we at BFP missed them? Or perhaps, it is as if Kenrick Hutson never existed at all. There are strange things that happen on this island sometimes – made stranger still by the silence of the “professional” news media. Was Kenrick Hutson Murdered …or Assassinated? “Just returned from Barbados. I both admire and am afraid of Barbados. Barbados represents the ultimate in first world mimickry. Its a beautiful little country with some of the hardest working people you can find. Its economy and living standards are first world, and its stability as a nation is great. I admire all of those. Barbados has shown a capacity to absorb foreign direct investment to the point where it is attractive for foreign dollars to be in Barbados because foreigners want to holiday there, they want to live there, they want to even die there. You heard that old joke where the parts of the body argue about who should be the boss? The National Union of Public Workers (NUPW) and the workers at the SSA just proved the joke to be true. Sanitation Service Authority employees struck in support of manager Stanton Alleyne, who was fired over corruption allegations. With no garbage being collected and even no bodies being buried for five days, the government caved in and gave Alleyne his job back. 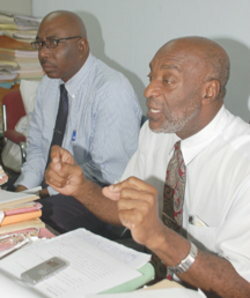 NUPW officials Dennis Clarke and Walter Maloney (photo) are at this moment, arguably the most powerful men in Barbados. A few words from them and the whole country began to stink. Bajans couldn’t even dispose of their own garbage as NUPW workers blocked roads with sabotaged trucks – an illegal act for which no one will ever be held responsible. In a country that depends so heavily upon tourism, the guys who remove the garbage have far more to do with the health of the economy than they get credit for. And we’re not just talking about their ability to shut things down – we’re talking about the important role that they play in making Barbados as desirable destination. But the garbage strike and the firing and re-hiring of Stanton Alleyne are only side-shows in the national debate about our culture of corruption. The Board of the Sanitation Service Authority terminated acting manager Stanton Alleyne five days ago after they received information about him accepting money from an SSA contractor in 1999. Under Barbados laws that promote a culture of corruption by public officials, there is no offense in Alleyne accepting a “gift” from anyone unless it can be shown to be a direct bribe for a specific outcome. So although any fool can see that it was a corrupt act for Allenye to accept money from a contractor with whom the government does business – it might not have been an illegal act under our impotent laws. The SSA Board may or may not have handled the situation as they would now – BUT GIVE THEM CREDIT… they at least had the courage and integrity to try and deal with this obvious corruption by Stanton Alleyne. The SSA Board is just like the rest of us – finally we have decided that we will no longer tolerate this corrupt behaviour, but we lack the knowledge, experience and the legal tools and procedures to effectively deal with specific cases or the wider perspective. Some of us don’t even realise what corruption is. Every week, folks come to Barbados Free Press and comment that there is no problem with elected or appointed government officials receiving gifts from companies who have government contracts as long as the officials don’t do anything specific in return. These people are either naive or involved in the corruption themselves. Either way, they are part of the problem that we face in trying to clear up this culture of “gifts” that does so much harm to the country and totally destroys respect for government. Stanton Alleyne’s lawyers proclaimed that their client is “vindicated” by the recent settlement that sees him return to his job. The NUPW has declared a “victory”. We ask “Victory for whom?” Certainly not for the people of Barbados who continue to pay for the corruption and live in a society where government officials become rich at the taxpayers’ expense. Alleyne may or may not eventually have to answer for his corrupt act of receiving money from a government contractor, but one thing is certain – these situations will be seen more frequently as Bajans finally decide they have had enough of corruption by people in the public service. Thanks so much to our friend Keith Ripley at Temas Blog for reminding us that everyone can get free tested for HIV today at ScotiaBank branches. In the Barbados Free Press family only Auntie Moses, Marcus and Shona don’t need testing. Shona and I (Marcus) have both been tested many years ago and have remained faithful to each other. Auntie Moses doesn’t need testing because, well, I think that when Frank Sinatra was last visiting the island… Oh, never mind! If you happen to be in Anguilla, Antigua & Barbuda, Barbados, Dominica, St. Lucia, St. Kitts & Nevis, St. Maarten or Jamaica tomorrow, Friday 27 June, stop by the local branch of Scotiabank. “It happens all the time in countries ruled by Islamic law and nothing is said or done about it, but when it happens in Britain, Europe or North America it is news. … from BFP’s article Canadian Father Murders Teenage Daughter Over Refusal To Wear Muslim Headscarf Hijab. Now Canadian police have upgraded the charges against the brother to murder. It is alleged that 27 year-old Waqas Parvez assisted his father to murder his 16 year-old sister. BFP will continue to follow this and other North American and European honour-killing cases along with several other human rights issues that interest our writers.